This week we will be adding all-sky surveys from the Planck mission to SkyView. Planck provides nine all-sky images in the range from roughly 30-1000 GeV. While many Planck science goals relate to cosmology, Planck’s resolution approaches that of IRAS, so that Planck images may be of interest for imaging the the far infrared. Planck has roughly twice the resolution and substantially higher sensitivity than WMAP at the frequencies over which they overlap. Planck data extends to almost an order of magnitude higher frequency than the ~100 GeV cutoff for WMAP and the higher frequency data has higher resolution. WMAP does extend to slightly lower frequencies than the longest wavelength data from Planck. These new surveys represent the first release of Planck data. 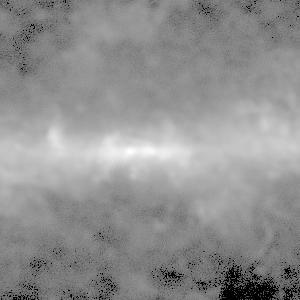 Data has been downloaded from the IRSA’s Planck archive. 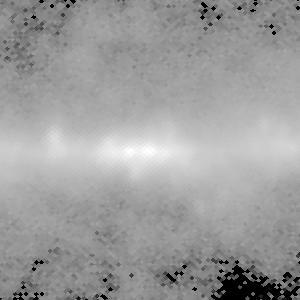 Planck data is stored in SkyView as a single all-sky HEALPix image. For the high frequency data the data file is 600 MB which means that it can take a little while to query Planck images. The three lower frequency bands are a bit faster since they are only 1/4 the size. We will be looking at creating tiles for for the Planck data if the delays seem unacceptable. The following images give the WMAP-W image and Planck 100 GHz image of the 10 degrees of sky at the Galactic Center. These are at roughly the same frequency. While there is excellent agreement between the two, the superior resolution of the Planck data is immediately apparent. Congratulations to ESA and the Planck teams in Europe and the US for their very impressive results. This entry was posted in Discussion, Notices and tagged New Surveys, Planck, WMAP. Bookmark the permalink. been waiting for this day : ) Time to go play with some new data now.